Was Robin Hood a Marxist? Simon Schama could use a dose of classical-liberal theory. Most of us can be forgiven for knowing Marxist theory better than the liberal tradition — it’s hard not to drink Marxism in with our schooling and culture — but popular historical narrative really does suffer by the omission of the "bourgeois historians" whom Marx himself credits as the precursors of his class theory. In the BBC TV series A History of Britain, Schama asks about the English Peasants’ Revolt of 1381, "Was this a class war, then?" (A term, he explains parenthetically that "we’re not supposed to use since the official burial of Marxism.") A pause, while the camera angle changes to closeup. "Yes," he says plainly. "It was." "Not surprisingly," writes Schama in the print version of A History of Britain, "it was in the second half of the fourteenth century that the legends of Robin Hood … first became genuinely popular." But as I write in "Class War in the Time of Robin Hood" in today’s Freeman, Schama is appealing to the wrong class theory if he wants to explain the mindset of the commoners marching on London in the 14th century. I’m far from the first to offer a libertarian revision of Robin Hood’s politics, but where I focus on the ideology of his earliest historical audience, most other treatments focus on the particulars of the legend. "It is said," Rand has Ragnar Danneskjöld concede in Atlas Shrugged, that Robin Hood "fought against the looting rulers and returned the loot to those who had been robbed, but that is not the meaning of the legend which has survived. 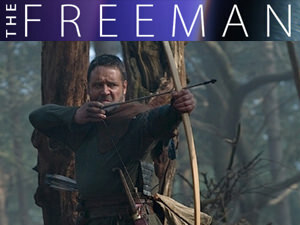 What do you think: is Robin Hood worth claiming for our tradition? The historical Robin Hood was no Marxist at all. The “rich” he robbed from were the invading, conquering Norman French and their English cronies, such as the Sheriff of Nottingham. The “poor” he gave to were the loyal, impoverished, dispossessed English. Robin Hood did not steal from the “rich” and give to the poor. He stole from the GOVERNMENT who was taking confiscatory taxes from the people, and gave them their taxes back. Excellent point, Han Solo. Exactly! I don´t think Robin Hood was a marxist, but i think he might perfectly have been a proto-liberal. In fact, there isn´t so much difference between that middle-age society in which a dictator threaten the people with coercion – death, public punishment and taxes -. It is in fact true that nowadays law exists, but tends to be applied only to the ordinary people that cannot pay for the services of the best lawyers and not to those who have the money to combat the courts.